Since I started wearing Sì I have been complimented so many times. It is always lovely to be told you smell pretty. Over the weekend, I had a full blown conversation with the barmaid in the hotel we were staying in about how wonderful this perfume is, she told me it smells different on me to how it was on her when she tried it. 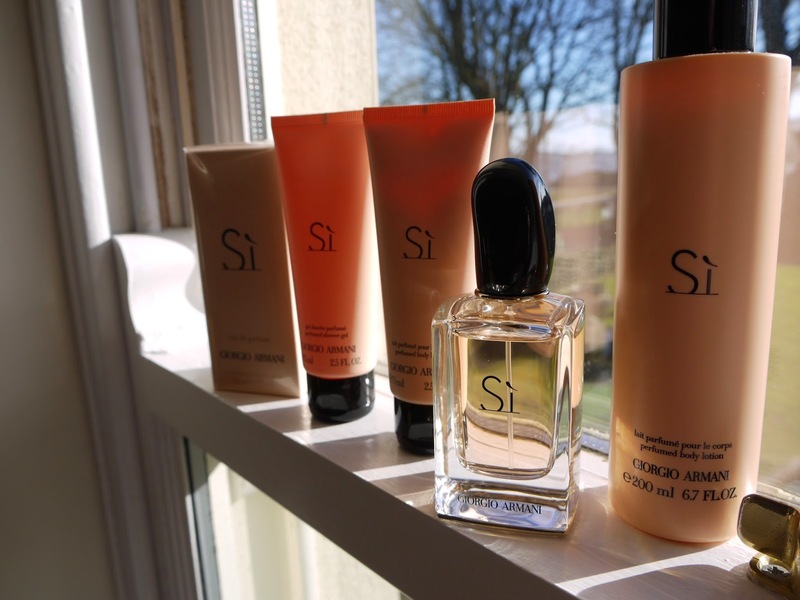 '“Sì is my tribute to modern femininity, an irresistible combination of grace, strength and independent spirit.” – Giorgio Armani. I was kindly sent a 30ml bottle by Giorgio Armani's PR and fell in love. The smell captivated me, it always takes me a while to write about what I love just incase I change my mind. But I am certain about this beautiful scent. A few months later I was sent a press release about the body lotion and I got pretty excited, I ran out and bought it straight away. Oddly, I get a fake tan' smell off it. A little disappointing and not something I would expect from such a pricey product, it cost me 46 euro from boots. I wouldn't recommend it. Lets be honest, as far as the perfume goes, this is a case of 'I think it smells really nice'. Perfume is very personal,its hard to recommend with out sniffing it yourself. In other Armani news, Heres a little sneak peek of a lipstick I will be reviewing very soon. Haha I read this post last night before bed and I had a dream about buying it in BTs.